Modifier stack for meshes, curves, metaballs. Campbell Barton (campbellbarton) added a comment to D4530: Join Triangles Modifier. @Andrew Zhou (dodeqaa) for every constructive modifier it's currently converting all data to BMesh and back - even if all of the modifier's in the stack operate on BMesh data types. Andrew Zhou (dodeqaa) added a comment to D4530: Join Triangles Modifier. Before getting into code review or looking into details I'd like to see example uses cases for this modifier. Postpone until nodal modifiers are supported. Make this an optional post-process for the decimate modifier. All BMesh operators _could_ be made into modifiers, however the modifier system isn't designed for constructive modelling (at least not with many fine grained operations). AV (Dspazio) added a comment to D4530: Join Triangles Modifier. Modifier nodes are planned, I'd rather postpone this modifier until the new system is implemented. Campbell Barton (campbellbarton) changed Type from Bug to To Do on T62716: Curve "solidify" modifier glitch. Martin Felke (scorpion81) added a comment to D4530: Join Triangles Modifier. Philipp Oeser (lichtwerk) closed T53051: Cloth Dynamic Mesh And Mesh Cache as Invalid. Afaics you dont really have a deforming modifier preceeding the cloth modifier. So you would have to make sure e.g. the skirt is deformed first, then cloth sim will work correctly after. Since we dont have the original armature for the character at hand anymore [everything has been baked to mdd], we need a relationship between the mdd cache and the skirt. Campbell Barton (campbellbarton) added a comment to T62716: Curve "solidify" modifier glitch. This has been reported before, the issue is curve scan-fill creates zero area faces that give bad normals for solidify to operate on. Philipp Oeser (lichtwerk) triaged T62716: Curve "solidify" modifier glitch as Confirmed, Medium priority. Before getting into code review or looking into details I'd like to see more example uses cases for this modifier. Ish Bosamiya (ish_bosamiya) updated the diff for D4569: Vertex Group Support For Triangulate Modifier. Ish Bosamiya (ish_bosamiya) updated the diff for D4530: Join Triangles Modifier. Brecht Van Lommel (brecht) closed D4367: Triangulate modifier add side limit. Jacques Lucke (JacquesLucke) added a comment to D4367: Triangulate modifier add side limit. @Brecht Van Lommel (brecht), should this be merged, or do we come back to this patch when Blender 2.8 is released? Ish Bosamiya (ish_bosamiya) added a comment to D4530: Join Triangles Modifier. that way the modifier can still work with animation without beeing applied? If this is used in animations the tri to quad conversion will 'pop' on deformation. Can you point to where this was requested? Were example use cases given? 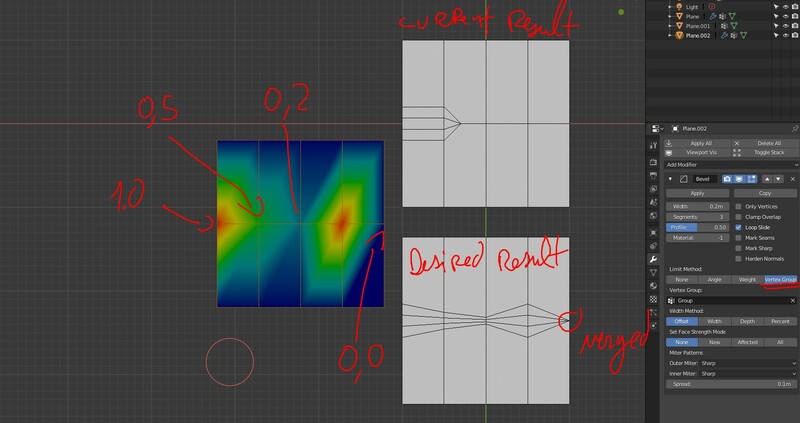 Why does it have to be useful in animation, why can't we users have more ways to just model various pieces of content non-destructively (like a remove-doubles modifier which would be useful with boolean operations)? Nabil Adel (mywa880) added a comment to D4530: Join Triangles Modifier. Adam Friesen (ace_dragon) added a comment to D4530: Join Triangles Modifier. Ish Bosamiya (ish_bosamiya) added a project to D4569: Vertex Group Support For Triangulate Modifier: Modifiers. Bastien Montagne (mont29) closed T52873: Vertex Weight Proximity breaks Rigid Body simulation as Archived. Yes, this is indeed a chicken & egg issue (and yes, it also happens in 2.7x). Guess we can close that as known limitation for now, then. Sergey Sharybin (sergey) added a comment to T52873: Vertex Weight Proximity breaks Rigid Body simulation. But same happens in 2.7? This sounds like a feedback loop between rigid body simulation which needs geometry for the collisions, but geometry needs transform for modifier stack. While we can avoid some dependency cycles here, the order of updates might be wrong from users perspective. And the only user-controllable solution here would be to go node based. Bastien Montagne (mont29) added a comment to T52873: Vertex Weight Proximity breaks Rigid Body simulation. Deg warning about DEG_OB_COMP_GEOMETRY relation is now fixed, but the rigid body simulation remains completely broken in 2.8 currently here (neither of the two displace modifiers work, only really moving red object works currently). Using an empty (or center point of any object) is a valid usecase of this modifier, will check on those relations tagging. Sergey Sharybin (sergey) reassigned T52873: Vertex Weight Proximity breaks Rigid Body simulation from Sergey Sharybin (sergey) to Bastien Montagne (mont29). The issue in code i saw was related on a fake dependency cycle, which is now fixed in rB099a4104788. Now i can open the file and there is a playback going on. AV (Dspazio) added a watcher for Modifiers: AV (Dspazio). cédric lepiller (pitiwazou) added a comment to D4367: Triangulate modifier add side limit. Any news about this patch? Or the triangulate on Ngons, this is just an option to add to the triangulate modifier and it would help a lot!!!!!! Frederico Martins (frederico4d) added a comment to T62739: Bevel Weight not affecting Bevel modifier correctly. that is sad for me unfortunately since there is no other way to do this in blender without just working on geometry and loosing editability :( this was a great feature for me, on this project and other stuff ive used it before (RIP). Howard Trickey (howardt) closed T62739: Bevel Weight not affecting Bevel modifier correctly as Invalid. Sorry, I am closing this as "working as intended" because the code is doing what I intended: that is, it is choosing to keep widths even along their edges as a higher priority than trying to half-way meet an unmeetable set of width constraints. Fin O'Riordan (fin.eskimo) added a comment to D4530: Join Triangles Modifier. +1 Great work... I hope to see this make the cut. Howard Trickey (howardt) added a comment to T62739: Bevel Weight not affecting Bevel modifier correctly. The behavior in 2.79 is not really intended -- it is more an accidental consequence of a choice made to solve conflicting specifications. What the specifications say is that one edge is supposed to have one particular bevel width all the way along it, and the other edge (with the adjusting weight) is supposed to have another weight all the way along it. Where they meet is a conflict. The conflict used to be solved by taking an average, which gave the smooth tapering effect you saw. But for other cases (especially when there are loops) that is not nearly good enough, so I switched to using a least-squares optimization some time in the 2.79 series (I see that you note that this was working for a while in 2.79 and then stopped working, so maybe that was when I made this switch). William Reynish (billreynish) triaged T62739: Bevel Weight not affecting Bevel modifier correctly as Confirmed, Medium priority. I can reproduce the difference in behavior here. William Reynish (billreynish) assigned T62739: Bevel Weight not affecting Bevel modifier correctly to Howard Trickey (howardt). Frederico Martins (frederico4d) added a project to T62739: Bevel Weight not affecting Bevel modifier correctly: Modifiers. Erick Tukuniata (erickblender) added a comment to D4530: Join Triangles Modifier. cédric lepiller (pitiwazou) added a comment to D4530: Join Triangles Modifier. Juri Unt (juri3d) added a comment to D4530: Join Triangles Modifier. Thank you Ish for your hard work!